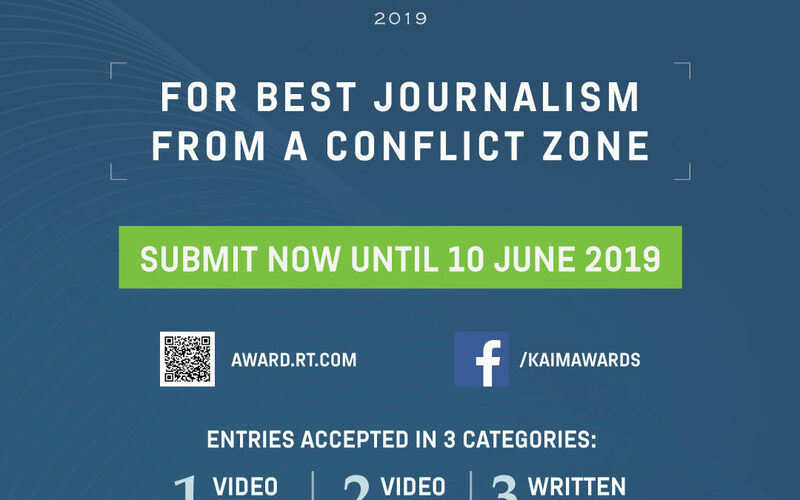 MOSCOW, APRIL 11– RT is now accepting entries for the 2019 Khaled Alkhateb Memorial Awards, an annual international competition that recognizes the best journalism from conflict zones. The competition, now in its second year, was established in honor of RT Arabic freelancer, Khaled Alkhateb, who died in 2017 while reporting from Syria. The International Khaled Alkhateb Memorial Awards is presented in three categories: Best Video Journalism from a Conflict Zone: Long Form, Best Video Journalism from a Conflict Zone: Short Form, and Best Written Journalism from a Conflict Zone. The inaugural year of the competition in 2018 saw entries from more than 20 countries in 10 different languages. The winners were journalists from Iraq and Ireland, whose reporting shed light on the situation in Iraq and Syria following the expulsion of ISIS, and a journalist from Singapore for her coverage of the seizure of Marawi, Philippines by ISIS terrorists. Judging was conducted by an international jury of news media professionals and experts on the subject of war and armed conflicts, including former CBS correspondent Philip Ittner and the Association for International Broadcasting’s Tom Wragg. The winners of the second annual Khaled Alkhateb Memorial Awards will be announced on July 30, which marks the day on which 25-year-old RT Arabic stringer Khaled Alkhateb was killed by ISIS shelling in Homs, Syria, in 2017. Khaled had been covering the fighting between Syrian government forces and terrorists. In 2018, Russian President Vladimir Putin posthumously honored Khaled with the Medal for Courage. Find our more and submit your entry at https://award.rt.com.